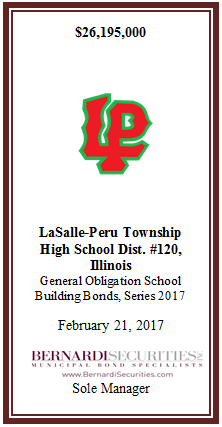 The LaSalle-Peru Township High School District #120, which encompasses parts of LaSalle and Bureau Counties in Illinois, successfully issued $9,760,000 General Obligation School Building Bonds, Series 2016 on December 28, 2016 and $26,195,000 General Obligation School Building Bonds, Series 2017 on February 21, 2017. The Bonds were approved by the voters of the District at the general primary election held on November 8, 2016, and were issued for the purpose of renovating and rehabilitating District facilities and paying costs of the issuance associated with the Bonds. The improvements include, but are not limited to, removing asbestos, adding fire sprinklers, increasing accessibility to comply with the Americans with Disabilities Act, constructing more secure entrances, making energy efficiency improvements, renovating classrooms and science labs, and financing other School District capital costs. The Bonds were rated “AA-” (Stable Outlook) by Standard and Poor’s and insured by Build America Mutual. Both Bonds will be repaid over a twenty year time frame. The Series 2016 Bonds have a true interest cost of 3.48% and the Series 2017 Bonds have a true interest cost of 3.70%. The Bonds are to be repaid from ad valorem taxes levied against all of the taxable property located in the District, without limitation as to rate or amount.